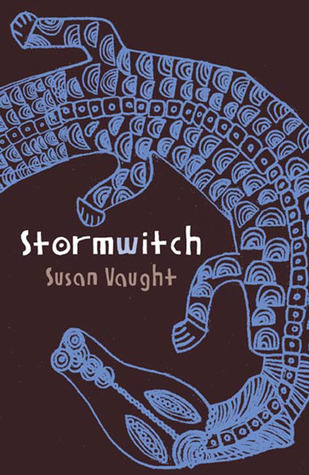 I am embarrassed to admit that I read Susan Vaught's Stormwitch for the A More Diverse Universe blog tour and then, in preparing to write this review, realized that Susan Vaught is not, in fact, a person of color. Eek! I hope you'll forgive me for thinking she was, though, when you hear the plot summary of this book. It's about Ruba, a 16-year-old Haitian orphan. Ruba was raised by her grandmother to be a strong Amazon warrior, keeping the world safe from the evil spirits that often take the form of hurricanes. But her grandmother died a hurricane and Ruba moved to the Mississippi Delta in 1969 to live with her other grandma, a fiercely religious woman who thinks that Ruba's training is dark magic. But there are storms raging all around Ruba, who enters a world still dominated by the Ku Klux Klan and racial violence, and who must also save her loved ones from Hurricane Camille. The premise of this book really intrigued me - a feminist warrior who takes on nature and racism?! Absolutely amazing. And I think if I had been many years younger, I might have loved this book. But it just felt a little too young for me, and the points the author wanted to make about magic and religion and race were pushed very hard. While Ruba was likeable and brave, I don't think she developed much as a character during the story; rather, she started out strong, stayed brave throughout, and ended strong, too. Her grandmothers were more nuanced and I would have liked to know them better, but we didn't get too much depth. In one sense, I think Vaught did a disservice to the plot of this book by making it a middle grade novel. It was short, but the language could become so poetic that I was surprised the book was intended for such a young audience. And Vaught clearly put a lot of thought and care into the characters, but there was so much going on in so little space that they didn't get much chance to shine or grow. And all the Blacks were good and kind and strong, while the whites were not very likeable. And all the women were vivid and kind and brave, while the men were not quite up to snuff. I hate to say it, but I feel like the magic/fantasy part of the story took away rather than added to my enjoyment of the novel. While I appreciate the references to women warriors saving the world and battling evil, I found the idea of one girl fighting against a hurricane and winning hard to believe. But then, I'm not the intended audience for this book, and maybe a younger reader would understand that part better than I did. So I admit I didn't love the plot or the story, but I do love what Vaught did with the setting. It may be that I am just now becoming aware of it, but it seems like so many books are out there now that are expanding the reach and consequences of the Civil Rights movement. Learning about it in school, it was as though Freedom Summer happened, and Martin Luther King, Jr. gave a speech, and there was some violence, but then all the racism ended. But obviously, things were far more complicated than that, and I was impressed that Vaught brought so much into a book for young readers. The book is set in 1969, and we see the strong hold that racism has over Ruba's town, where the Klan still reigns. Segregation and Black Power are touchy subjects, but Ruba doesn't dance around them. She's frank about the role that Africans played in the slave trade, open about her belief in magic and her powers, confident enough to stand up to people with whom she disagrees, and brave enough to take on members of the KKK. Really, what was great about this book was that it was not apologetic. Ruba believes in equality and she wants it now, in no half-measures. She knows that her culture's past is not perfect, but she is more aware of it than most of her friends and family are of theirs, and she embraces her history for its strengths and tries to find methods to defend against its weaknesses. It's a pretty great system, and it works out quite well for her. When the points or morals are pushed too hard, I get practically angry. Whether in film or literature, I like my "life lessons" a bit more subtle. An interesting premise for a book, and a very thoughtful review! It sounds like the author veered away from fantasy and went too much towards fable. I'm sorry you didn't like it more overall because it sounds like it had a lot of potential. I'm also giggling because you thought the author was a writer of color and discovered she wasn't. Unless there's an author photo (and not always then), I am particularly bad about having a clue about the race or ethnicity of an author. I would have loved this as a child but think I would probably find it too heavy handed as an adult. The premise is interesting though. If this were an adult novel, and/or the themes were offered with more subtlety, it'd be right up my alley. I love the premise, and the fact that I have family roots in the Mississippi Delta makes it even more intriguing. I loved your review -- thoughtful and balanced. Hurricane Camille! I know Hurricane Camille! That's one of the hurricanes that little me bragged about my familial home having survived through. Camille and Betsy (and now, I suppose, Andrew and Katrina and Gustav). I think I like my books with a little more gray area instead of such black and white parameters. The fact that all the men were bad, and all the women good, just as the racial issues were sort of cut and dried would have probably bothered me. I guess I just don't take to the middle grade books like I do to YA. They often seem simplistic while also being very vocabulary dense. It's not a combination that works well for me. I loved Vaught's recent Freaks Like Us. I'm sorry this one didn't entirely work for you.